Helps To Keep Your Heart Healthy! These nuts are rich in healthy monounsaturated fats which are said to be cardioprotective by reducing cholesterol level and help to clean the arteries. Macadamia also lowers the level of triglycerides, which is a kind of body fat and reduces the risk of coronary disease. Another health benefit of macadamia comes from their high flavonoid content. Flavonoids, which are found naturally in these plants help to prevent cells from damage and protects from environmental toxins. These flavonoids convert into antioxidants in our body. These antioxidants search and destroy free radicals and protect our bodies from various diseases and certain types of cancer which include breast, cervical, lung, prostate and stomach cancer. The fat content of macadamias helps to curb your appetite much longer than a sweet treat. Macadamias are also a source of palmitoleic acid which increases fat metabolism and reduces fat storage – bonus! You only need a few to feel satisfied as a snack, so despite their price, you won’t need many to get a hunger-busting, nutrient-rich fix. Macadamias are an excellent source of protein, calcium, potassium, dietary fiber and antioxidants. They are also very low in sodium. all of these factors make them a fabulous beauty food, giving your hair and nails a healthy sheen and your skin a nourished glow! That’s right, macadamias contain around 7% dietary fiber, and both the insoluble and soluble types, helping to not only promote satiety, but provide roughage sweeping toxins out of the body, and aiding digestion. Phosphorus and magnesium are abundant in macadamias, and play a variety of roles including bone and teeth mineralization, metabolism, absorption and transportation of nutrients. Calcium also helps in the formation of teeth and bones. Manganese in macadamias also help the body to deposit new bone tissue so that the skeleton stays strong as you age. Macadamias contain copper, B1, magnesium, and manganese which helps to make healthy neurotransmitters, the chemicals which our brain cells use to send chemical signals, and nourish the brain. Copper also helps to ensure proper growth of the body, efficient utilization of iron, proper enzymatic reactions, as well as improved health of connective tissues, hair, and eyes! Consuming too many omega-6 fatty acids in our diet can be a contributing factor to chronic inflammation in the body. Chronic inflammation has been linked to a variety of diseases such as cancer, heart disease, diabetes and other life-threatening conditions. A handful of nuts a day, or a spread of nut butter in your smoothie is a great way to get added protein, fiber, and vitamins and minerals. But most nuts tend to be higher in omega-6 fats than omega-3s, which can tip our body into an inflammatory state if we don’t balance it out with omega-3s from other foods too. Macadamias, on the other hand, are much lower in omega-6s. For example, pecans contain 3.7g per 100g, almonds 3.4g, and cashews 2.2g compared to 0.36g macadamias. The incidence of heart disease is significantly lower in people who eat nuts regularly (more than five times per week) than in those who eat nuts less than once a week. So why not include some of these nutritious macadamias and start reaping their benefits today! There is no better way of having the above benefits other than planting your own Macadamia nuts. You can book for seedlings today from Oxfarm organic Ltd and we will take you through how you can plat them and get the best out of them. 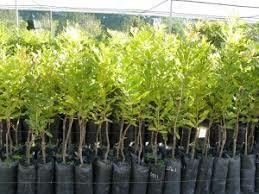 We have modern grafted varieties which matures first (less than tree years). Visit our offices or contact us today and book.